Travel time to North Seymour is about 30 minutes by boat from Santa Cruz’s northern dock at the Itabaca Channel. North Seymour has an area of 1.9 square kilometers (~0.7 sq mi). While diving at North Seymour, you will see a variety of marine life like hammerhead sharks, turtles, morays, manta rays, whitetip reef sharks, and snappers. 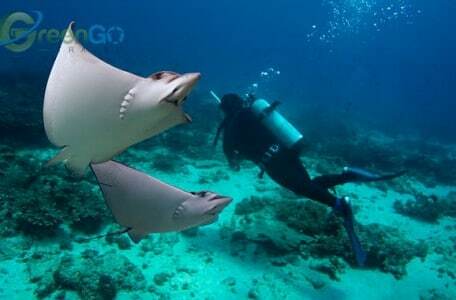 There are many different dive sites for all levels of diving experience. With the greatest variety of marine species, this area is a favorite among locals and guests alike. Expect constant wildlife surprises. Here divers can explore a botanical underwater setting where garden eels peek out from the sandy bottom, bright and neon colored reef fish swim near the reefs, sardines shine against the sun light, and white tipped reef sharks rest among sea turtles. A beautiful setting.